It’s been said that losing a child is the greatest challenge anyone can ever face. Grief clouds perception, pain disrupts routine, and goals are pushed aside in the dark chaos of loss. In the days and months that follow, just putting one foot in front of the other takes monumental effort. Yet it can also be a catalyst, allowing the grieving parent to honor what has been lost by focusing on what remains to be gained. For Yasmin Tate, that meant returning to college. “I needed something positive to help heal my life. I needed peace,” she says. A single Memphis mother of two daughters, Yasmin will never forget the week in 2007 when her life changed forever. Daughter Erika, a 22-year-old senior at Lane College, came home on Wednesday, went to the hospital on Friday, and died on Monday. Yasmin came to hate Mondays. “Erika was my youngest, and we were very, very close. I didn’t know what else to do but pray and ask for direction,” Yasmin recalls. “My faith in God is what kept me standing” — faith, and unceasing encouragement from friends and older daughter Aniysha. “Aniysha was my biggest supporter, and she still is,” Yasmin says. “I don’t even know how I got to work, or did my job, for a long time. I was in another place.” But friends and family pushed her to keep moving, and that meant trying to enroll in Bethel in 2008. “I had heard good things about the school. I knew Bethel was religion-based, and I really wanted to take some religion classes. I also understood that it was designed for working adults with families.”She was then 53 years old, working fulltime as the lead in the Pain-Management Billing Department at Advanced Toxicology Network. That’s when Yasmin discovered she had a hold on her original college transcripts, due to defaulting on an early student loan. “So I took another part-time job, and I worked, and I worked, and I paid off that loan. And when I did, I went right back to Bethel,” she recalls. Yasmin took her advice. And Mondays, she says, really did get better. “I was still a grieving mother, and I came to school painfully for the first few months.” But Monday after Monday, Aniysha, Terika, friends and classmates checked on her, encouraged her, supported her. Six months after Yasmin’s return to college, “I had a flood and lost everything in my apartment. I lost a lot of my deceased daughter’s things, which compounded everything. I really can’t praise Bethel enough for the support I received,” she says. But Yasmin wasn’t finished yet. She went right on to pursue a Master of Arts in Conflict Resolution at Bethel, graduating last year. 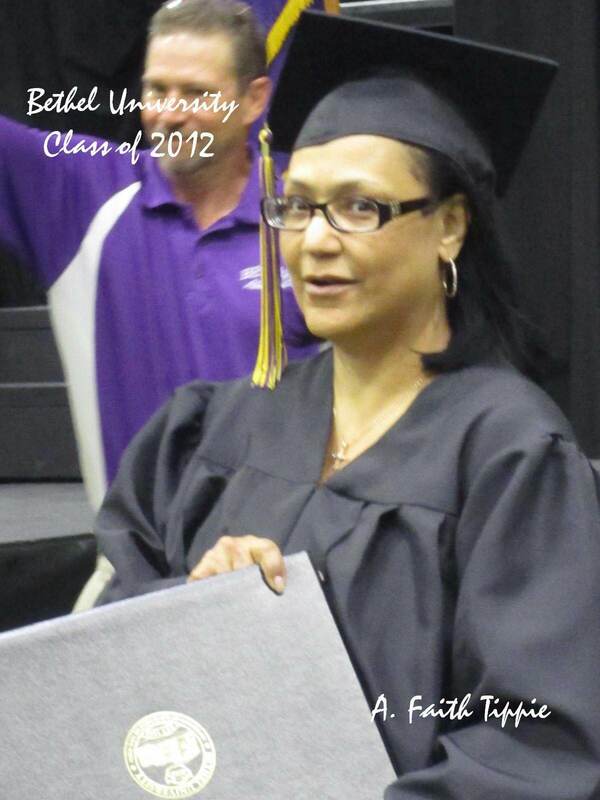 And, just this week, she completed her application for Bethel’s MBA program at the tender age of 61. This entry was posted in News and Information on September 16, 2015 by bethelu.